A proposal indicating progress and what remains to be done; a clear work plan/activities and a budget for finalizing the thesis and disseminating the research findings. Letters of support for the application from supervisor and preferably endorsed by the Dean of Faculty/School where the applicant is registered, indicating student study and research progress to date, and what remains to be done. For an understanding of the RUFORUM mission and the emphasis which underpins selections, general information and guidelines on Doctoral scholarships, you are referred to the RUFORUM website and to the Competitive Grants Scheme manual which also details RUFORUM policies applicable to copyright, ethics and related Issues (http://repository.ruforum.org/documents/ruforum-competitive-grants-system-manual). at least 2 articles in a refereed journal and various pamphlets, policy briefs and feedback workshops, as appropriate. A support letter from your supervisor, and preferably endorsed by the Dean, indicating that your studies are on track and that they expect you to complete within one year of receipt of funding. Female students are especially y encouraged to apply. The Award for this Call is a maximum of US$8,000 broken down as follows: Research $5,000; Conference $2,000; Supervision $500, and Journal Publication $500. Scholarship letters will be prepared for each successful applicant and sent to the Dean of the respective University Faculty/School. The Scholarship award letter specifies the amount of the scholarship, purpose and responsibility of the university in monitoring the use of the grant funds and reporting requirements. Funds are only disbursed after full commitment, through signature by the respective Dean and supervisor(s). Scholarships awarded are published in the RUFORUM Newsletter and are posted in the RUFORUM website. The supervisors are expected to mentor their students and will receive an acknowledgement fee after the thesis has been examined, the publication or acceptance of at least one paper in a referred journal. The student, through the supervisor will be required to submit a progress report after six months and then a completion report at the end of twelve months. When applying for the final payment the supervisor(s) is required to submit an electronic copy of the student’s thesis and publications, including pamphlets and briefs, to RUFORUM Secretariat for uploading on the RUFORUM website. 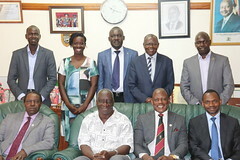 RUFORUM agrees to hold posting of the dissertations until papers have been accepted by journals. The deadline for receiving applications at RUFORUM Secretariat is 30th September 2015, 5.00 pm Uganda time. Administrative check/compliance review and feedback to applicants by 15th October 2015. Successful applicants informed electronically by 25th November 2015.
scholarships funds disbursed by 15th December 2015. After registering successfully you will be taken to your dashboard. What you see on your dashboard depends on the permissions that you have been assigned by the RIMS Administrator. After successfully logging on you will be taken to your dashboard. What you see on your dashboard depends on the permissions that you have been assigned by the RIMS Administrator.